Many manufacturers are defined by their luxury or executive sedans, but few make them better than BMW and Mercedes-Benz. 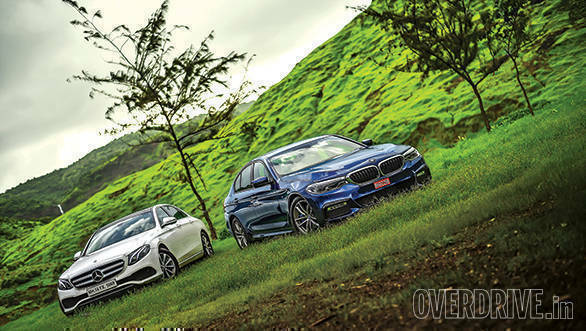 Both the BMW 5 Series and Mercedes E-Class are customary competitors, and their rivalry is such that it will be remembered well after the demise of the automobile as we know it. When Mercedes-Benz brings out a new E-Class, it's benchmarked against the 5 Series and the same is true for BMW. 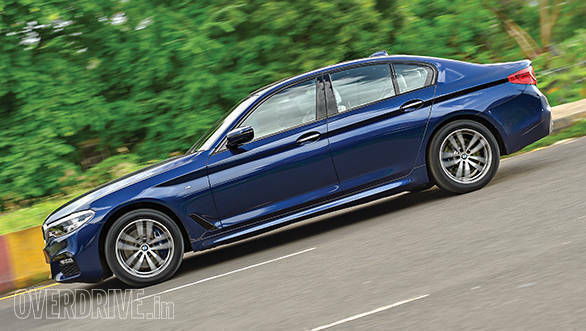 So when BMW launched the new seventh-generation 5 Series in India recently, we knew the time had again come to compare it with its traditional rival -- the E-Class. Over the last few years we have seen the 5 Series looking more and more like its bigger sibling the 7 Series with the styling of the E-Class also being inspired by the S-Class. The new 5 Series is no different and shares many styling elements with the 7 Series. But look closely and you realise that the designers have tried to treat some of the elements differently in an attempt to give the 5 Series a distinct identity. The kidney grilles are bigger and the headlights are also way larger than in the earlier 5 Series. It clearly has a more slippery shape and BMW has worked a lot on air management to improve the efficiency. The grille, for the first time, has what BMW calls an 'Active Air Stream' and this keeps track of engine and brake temperature and also that of various other components, and when required it automatically opens the air vents in the grille. It closes them when additional air is not required, and this improves the aerodynamics and helps fuel efficiency. Apparently, the more sharply shaped front bumper also limits air turbulence. The scoops on the fender behind the front two wheels are not there for just cosmetic value. They channel air to the front wheels reducing air resistance, which also aids fuel economy. The new BMW 5 Series is some 70kg lighter too, thanks to an increase in use of aluminium. At 4,936mm, it's also slightly longer and BMW says this has translated into more space in the interior. 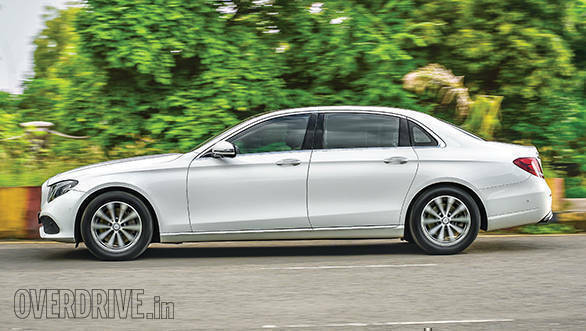 But where space is concerned, Mercedes-Benz has pulled out an ace by selling only the long-wheelbase (LWB) version of the E-Class in India. This E-Class LWB is 5,063mm long, a full 127mm more than the new 5 Series! 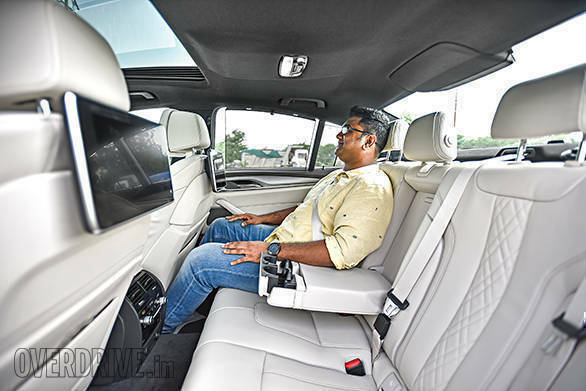 Obviously, the space inside is massive and when it comes to rear seat room and comfort, there is just no comparison because the E-Class is in another zone altogether. But it must be said the new BMW 5 Series easily wins the beauty contest. It's far sleeker with a sharply styled and sculpted body that makes it look so much sportier. In comparison, the Mercedes-Benz E-Class looks chubby and like it's carrying too much flab. Step inside either of the cars and you are sure to go 'wow'. 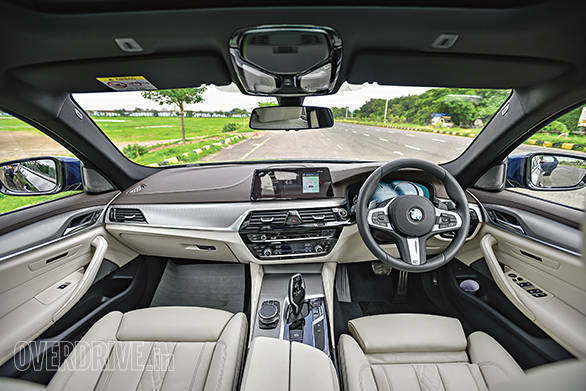 Yes, both cars have really smart-looking passenger compartments, and it's obvious that both BMW and Mercedes have put in a lot of effort and spent a lot of time to ensure that their car interiors not only look good but also make the occupants feel good. The design teams of both manufacturers have gone into great detail to make the cabins of the BMW 5 Series and the Mercedes-Benz E-Class a stylish and classy space to be in. The quality of materials and the fit and finish in the new 5 Series are top class. But the E-Class' cabin is certainly far better looking. In fact the styling and detailing of the E-Class' interior is so good that at times you don't feel like stepping out of it. Both the new BMW 5 Series and Mercedes- Benz E-Class have a full array of safety features including front, side and head airbags; ABS, ESP and traction control, attention assist etc. The BMW 5 Series comes with the next generation 'Head-Up Display' and the much-appreciated iDrive control system. It also has features such as gesture control, touchscreen display, wireless charging, parking assistant with surround view camera, remote control parking with BMW display key etc. The E-Class has a smartphone integration package for Android and Apple CarPlay, the Linguatronic voice-operated control system, the touch control buttons on the steering etc. The new 5 Series has adaptive LED headlights, and BMW says the curve light delivers maximum visibility on windy roads, allowing you to see what's coming around the bend earlier so you can be prepared. The full high beam light intuitively adapts its shape and intensity based on the driving conditions. We did a bit of night driving, of course not as much as we would have liked, and came away with the impression that these adaptive LED headlights work really well and are quite useful on our roads. 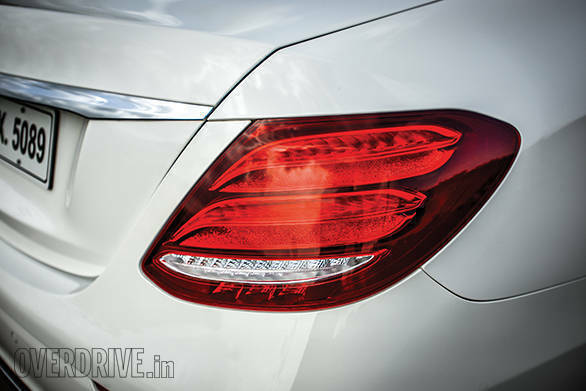 The E-Class also has LED headlamps, but these are not adaptive. If you are a passenger, the Mercedes-Benz E-Class has some features that completely take the game away from the new BMW 5 Series. As mentioned, there is way more room at the rear. The electric rear seats can be reclined and have a memory function too. The seat backrest can be tilted up to 37 degrees, and the adjustable headrests at the rear also come with a very comfortable additional pad. The E-Class also has a 'Chauffeur Package' where the front passenger seat is adjustable from the back and can be moved further ahead. This allows the passenger seated behind to stretch his legs even more. The window blinds on the E-Class are electric, whereas the ones on the 5 Series are manual. The white upholstery of the E-Class not only looks good, but also enhances the sense of space and brightens the mood. BMW has launched three variants of the new 5 Series in India - the 530d, 520d and the 530i which is powered by a petrol unit. We decided to focus on the diesels in this test as they sell in much larger numbers. The 520d is powered by a 2-litre 4-cylinder twin-turbo diesel engine that makes 190PS and 400Nm of torque. The 530d has a 3-litre inline 6-cylinder twin-turbo diesel that generates 265PS and 620Nm of torque. This powerful executive saloon takes on the Mercedes-Benz E350d that is driven by a 3-litre V6 diesel making 258PS and 620Nm of torque. Even though the 530d has 10 more horses, the torque is exactly the same as the E350d - this shows how closely they are benchmarked. Interestingly, Mercedes utilises a V6 while BMW has an inline-6, and both do exactly what is asked of them. The E220d has an all-aluminium 2-litre 4-cylinder engine under its bonnet that produces 192PS and 400Nm of torque, exactly the same amount as the 520d! In the BMW 5 Series, all engines are mated to an 8-speed automatic while the E-Class employs a 9-speed automatic to channelise power to the rear wheels. The torque figures may match but the behaviour on the road is still quite different. Both the 5 Series and E-Class have various driving modes that completely alter their response and behaviour. The modes in the 5 Series are Comfort, Sport and Ecopro, which ensures quick upshifts for better fuel efficiency. It also has an adaptive mode that automatically supports a sportier or relaxed driving style depending on the individual driving style and inputs to pedals and steering. The E-Class too has modes like Eco, Comfort and Sport. It also has a Sport + mode for even more extreme gear shifts and suspension dampening characteristics. There is also an Individual mode that allows the driver to set up the steering, engine and suspension as per his preference. For example, you can have the engine and steering in Sport mode but the suspension in Comfort. So you get better engine response, faster downshifts and a more eager steering, but the ride still remains soft and cushy. Interestingly, when you are stationary and go from Comfort to say Sport mode, you can actually feel the engine note change along with an increase in idling rpm! Put the show on the road and you almost immediately find the inline 6-cylinder engine in the new BMW 530d to be more eager and enthusiastic. Its response time is nearly immediate and it builds up revs almost in proportion to the pressure put on the accelerator pedal. The 530d's straight-6 engine is not just more responsive but it's also smoother and more silent than the E350d's V6. The 10 additional horses also make a difference, taking the BMW 530d from 0 to 100kmph in 5.8 seconds, a full second faster than the E350d. The E350d is actually no laggard; a 0-100kmph time of 6.8 seconds is actually damn good for an executive sedan. It's just that the 530d is bursting with so much energy and enthusiasm that it makes the E350d feel more relaxed and easy going. The 2-litre versions of both cars are also impressive performers. The BMW 520d's engine does not feel as responsive or as rev happy as the all-aluminium one in the E220d. 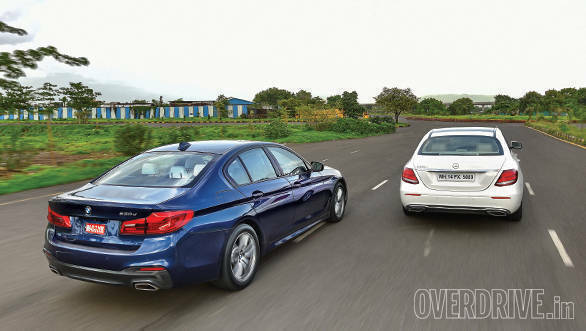 But the results in the 0 to 100kmph drag are quite different with the BMW 520d reaching the mark in 7.6 seconds and the E220d taking 8.4 seconds. While the 520d is certainly faster, it's the E220d with its happy to rev and sweet sounding engine that feels better getting to 100kmph. The in-gear acceleration or drivability of both the BMW 530d and 520d is slightly better than that of the Mercedes E250d and E220d. Both the automatic transmissions shift gears very smartly and seamlessly. But the 8-speed auto of the BMW 5 Series feels just a little more intuitive at selecting and shifting into the desired gear. It also seems to have lower ratios because if driven hard, it gets into the next higher gear very quickly. The same is the case while downshifting, especially in Sport mode. Approach a corner at speed and just tap the brake, and before you know it, the engine has blipped the throttle and the transmission has smartly downshifted. I would go as far as saying that the paddle shifters in the 5 Series are actually redundant, because the driver will find very little need to take the gear shifting into his own hands. Again just because the 8-speed auto of the BMW 5 Series is so good, it makes the 9-speed automatic of the Mercedes-Benz E-Class feel a little laid-back, which it actually is not. When it comes to stopping, both cars have good braking. In our 100 to 0kmph test, the Mercedes-Benz E350d came to a halt in 38.3 metres and the BMW 530d covered a distance of 39.9 metres before stopping. The brake pedals of both cars have good feel and are easy to modulate. There was a time one would have simply said the BMW 5 Series handles better and the Mercedes E-Class rides better. And that would have been the end of it. But now thanks to things like adaptive air suspension, driver modes, tyre choices, and of course the demands of distinctive markets like India, even the obvious has been turned on its head. Balancing ride comfort and agile handling and grip has always been a challenge. Manufacturers do strive to find the right balance, but more often than not, they end up pitching either in favour of ride or handling. But like I mentioned, things have changed now. Get behind the wheel of the new 5 Series and you soon learn that the BMW engineers have worked really hard to tune the chassis. It's almost as if they wanted to go back to BMW's roots and retrieve and reinstall the agility and sharp handling. The new BMW 5 Series, with its 50:50 weight distribution and all-new front twin wishbone and multi-link suspension set-up at the rear, grips the road very well and changes direction smartly. It quickly shrinks around you and starts feeling so much smaller than it actually is. Show it a series of corners and it carves them up faster than a slicing machine in a bread factory. There is very little body roll and the body stays level through most turns. 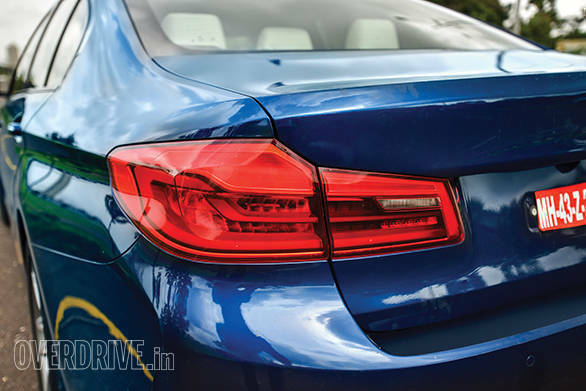 Where the E-Class wallows and floats, the 5 Series keeps its head down and responds to the driver's inputs in an extremely pleasing manner, especially in Sports mode. The steering of both the 5 Series and E-Class are precise but both don't offer a lot of feel or feedback. But the BMW's steering is still far more communicative. Drive both cars back to back in all the different modes and what becomes clear is that the aim of the engineers at BMW and Mercedes was quite different, especially with the E-Class LWB. As mentioned earlier, the overall length of the E-Class long wheelbase is 127mm more than the new 5 Series. The wheelbase of the E-Class is 3,079mm, a full 104mm longer than the 5 Series. But if you look at the width and track, the 5 Series is much wider. In fact, the rear track of the E-Class is 1,597mm, while that of the 5 Series is 1,630mm, 33mm more. These dimensions easily establish the fact that the 5 Series is designed to be agile and dynamic around curves, while the E-Class LWB is meant to offer occupants more space and move them around in a more relaxed and comfortable manner. Where all this logic turns on its head is ride quality. Logic says that if the BMW 5 Series handles better, then the Mercedes-Benz E-Class should ride better. But well this is not the case, especially in Comfort mode. I actually cannot believe I am writing this, but in Comfort mode the BMW 5 Series deals with potholes, undulations, etc. in a far better manner. It suppresses the imperfections in an appreciable manner and insulates the passengers way better than the E-Class. I will actually go as far to say the 5 Series feels like it's floating on air in Comfort mode. In comparison, while going over broken patches of road in the E-Class, the suspension allows the body to bounce a lot more and surprisingly it is more upset by potholes and you can feel and hear the thuds as the suspension battles to smother them. But in Sport mode, the BMW 5 Series does not feel as comfortable on bad roads and you can feel the bumps a lot more than you do in the E-Class. 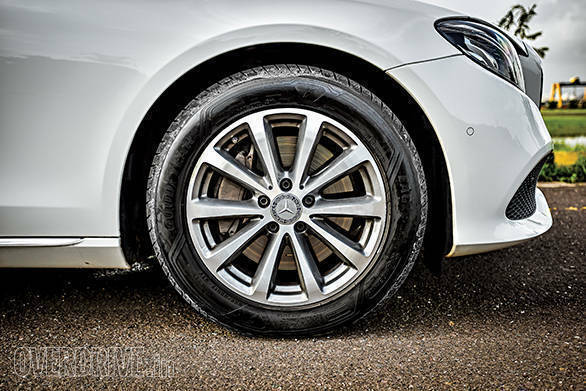 Interestingly, both the BMW 5 Series and Mercedes E- Class come with run-flat tyres and also emergency space saver spare wheels. Yes, BMW has finally responded to the call and requirements of the Indian market, and the new 5 Series finally has a space in the boot to store an integrated emergency spare wheel. With this spare wheel, boot space in the new BMW 5 Series is 400 litres. 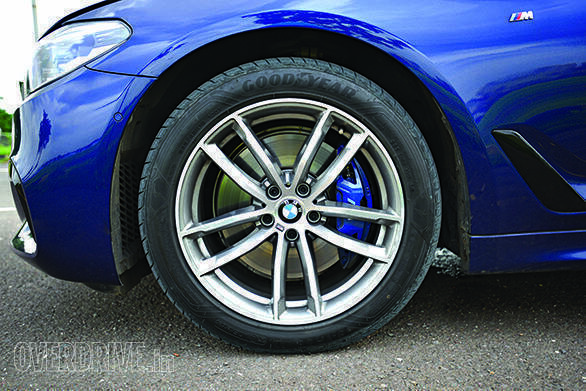 BMW has apparently also reinforced the sidewalls of the run-flat tyres, to reduce the risk of punctures. What I find fascinating is that Mercedes-Benz has taken a completely different approach in storing the spare wheel. They have not made any cavity or space in the boot to store the spare. Instead, this emergency wheel has been put into a sturdy plastic bag that is fastened in the boot with strong belts. What this means is that if you are driving around the city or going to the airport and need more boot space, you can simply remove the spare and leave it at home. In our tests, the Mercedes E350d had better overall fuel-efficiency figures than the BMW 530d. But the difference is marginal and not enough to influence a buying decision. Amongst the 2 litres, the Mercedes E220d was more fuel-efficient than the 520d, but again the difference was minor. Which one to go for, now that is a tough one. Maybe if this contest was between the 5 Series and the short-wheelbase E-Class, the answer would have been easier. But Mercedes-Benz is only selling the E-Class LWB version in India. It is obviously roomier and has a lot of rear seat space and features to pamper occupants. 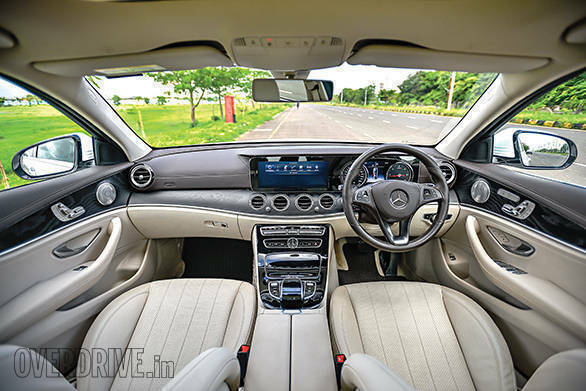 Its passenger compartment is also very smart looking and well laid out, and if you are the chauffeur-driven sort, the E-Class is obviously the car to go for. The new BMW 5 Series is a completely different machine. Its focus is more driver oriented, and it's built and designed to provide the person behind the wheel lots of pleasure and fun. So if you are the kind of person who spends more time in the driver's seat, the new BMW 5 Series is clearly for you. When you look at the pricing of these cars, you can see that BMW is fully aware of the inherent strengths of the E-Class LWB. And they have plainly tried using their lower and more attractive pricing to combat this. Quite honestly, it's difficult to pick a clear winner. It all depends on your priorities and pocket.